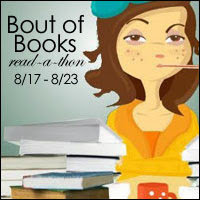 I will be participating in the upcoming Bout of Books Read-A-Thon this month. Unfortunately, I could not participate earlier this year, but I am excited to be participating now. I believe this will be the third time I have officially signed up to participate. Guess what?...I am going to be one of the challenge hosts! It's going to be so much fun, so make sure you check back here on Friday, August 21st for my challenge day. And also, if you have not done so already, sign up! Join in on this week of reading. You can see how to sign up here.